A body of water is a great addition to any garden, bringing peace and serenity and a habitat for all the bugs and beasts that help your plot to thrive. Many of us will have fond childhood memories of dipping with fishing nets (and maybe even catching the odd tiddler), watching pond skaters and even frogs milling around the sides of a pond on a lazy summer afternoon – what could be better?! Ponds bring kids a glimpse into life in and around water, and can be an endless source of interest and inspiration for young minds. Even in a space-restricted garden, a small container pond can be a fantastic way to welcome wildlife and get your little ones involved in a quick and easy project that will bring joy for years to come! 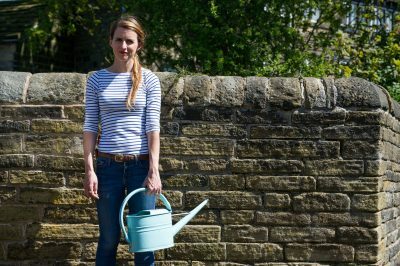 Spring is a great time to build your container pond, because as the seasons change you’ll be able to witness great changes as the plants grow and wildlife arrives – but any time of year where there’s warm weather is great, and the summer holidays are a great time for child and parent activities outdoors. It’s really easy to get started with your own container pond, and you don’t need loads of equipment either. The size and type of container you use is only really limited by your available space and imagination! Great ideas include a tin bath, an enamel sink or even your run-of-the-mill washing up bowl – it just has to hold water, and be able to withstand frosts. 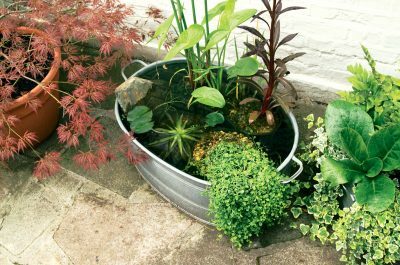 If you’re using a container that isn’t watertight or has holes, such as a sink or plant pot, you might want to consider lining it with pond liner first. Place your empty container where you’ll want it to be – it’ll be hard to move when full of water! It’s best in a place that is safe for small children, and that gets some sun daily, but not all the time. If you dig a hole into the ground to hold your pond, more creatures will be able to get in and out. If you’re keeping the pond edge above ground, create a miniature staircase up to the edge using bricks, logs etc – make sure it’s secure and won’t tumble down! Also bear in mind small mammals like mice and hedgehogs who don’t want to get trapped in the pond. Place a nice thick layer of clean gravel along the base of the pond, and create some levels using the bricks or rocks. … Plant up your pond! You can get special pond soil from garden centres that includes grit and is very low in nutrients, so it won’t provoke an unsightly algae bloom. Fully submerge some pondweed to oxygenate the pond and keep the water clear. 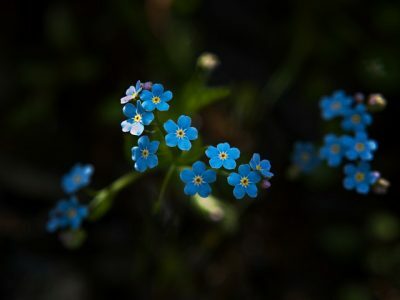 Good plant choices include rigid hornwort, lesser hornwort and water forget-me-not. Make sure your aquatic plants come in mesh pots so that water can circulate through their roots effectively. Now the layout of your pond is sorted, you might want to create some ledges sticking out of the water for frogs and bugs to sit on and shelter under the plants. … and wait! 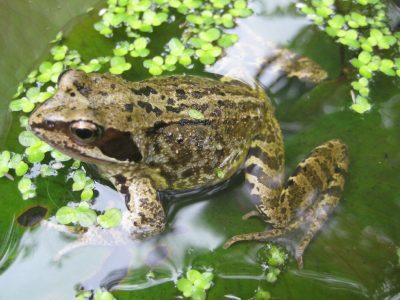 It’s important to be patient with your pond as it matures, and allow creatures some time to find it. You might find you get ‘blooms’ of algae or blanket weed, but don’t worry – kids love pulling this out by winding it round a stick (try it!). As the water matures you’ll soon spot bugs, amphibians and birds of all varieties enjoying their new water wonderland. Maintenance: In warmer weather, the water from the pond might evaporate slightly, in which case you’ll need to top it up! Again, rainwater is best, or use tap water that’s sat out for around 24 hours. In winter and autumn, cut back excess foliage to allow the water to get as much light as possible. Remove dead branches and leaves from the water to avoid stinky sludge forming on the bottom.The surface can be allowed to freeze, but don’t let everything freeze as this will really harm any plants. Enjoy your pond!